He lost his mother when he was 6 hours old, and he was raised with a goat. Maybe that's one explanation why 11-year-old Reason "has got personality!" Cheryl Dell, a veterinarian from Springville, California, first saw Reason when she was looking for a backup endurance horse. She couldn't, however, afford him at the time, and tried not to think about him. It was her husband who secretly went and looked at Reason and rode him, and arranged with Carl Fudge of Sturgeon Creek Arabians in Manitoba, Canada to make payments. Since then (2005) it's been a great ride: 21 finishes in 23 starts (in the US), 19 of those in the top five, including 8 wins and 4 BCs, and 5 hundred-mile finishes. On the endurance trails, Reason is "point and go" - though he wasn't always that way. "What a difference a couple of years makes in personality, vet checks, and on the trail. He's now all business, no nonsense. He grew up, got seasoned. He conserves his energy at the start... but he didn't do this at first! It used to take him a long time to pulse down at first because of the excitement. Now he gets excited, but he's calm about it, not amped or wacky. Now he's usually always down in 1-2 minutes in the vet gates." This is one main reason why Cheryl and Reason are a pair to be reckoned with in the Kentucky Cup. The Spaniards seem to have this down with many of their top international horses, cantering into a vet gate and the horse pulsing right down in under a minute. The pair participated in the World Endurance Championship in Malaysia last November, where Cheryl thought they might do well, but in the middle of the ride Cheryl was struck with a terrible stomach virus that put her into the hospital where she slept for 24 hours on IV fluids. "You know endurance riders can ride with anything - the flu, broken bones, but this came on fast and it knocked me out!" Reason travels well - "he's like 'whatever'" - and he flew into Kentucky a few days ago, with Cheryl as groom for him and 2 other horses. Reason is settled into a farm near the Kentucky Horse Park in Lexington, and Cheryl and her Pacific South teammates are in a house just down the road. "This is SO much easier than we've ever had it, being so close to the horses. In Malaysia we were 45 minutes from the horses, and we were always exhausted, running back and forth all day, several times a day, to take care of the horses, go to meetings, etc. Here we can relax, and take care of ourselves, which is just as important as taking care of the horse, as it benefits your horse if you are rested and healthy and ready to ride." Cheryl will be waiting for instructions from the Pac South coach Skip Lightfoot as to how to ride the 100-miler (4 riders will be chosen to ride on a team, 2 will ride as individuals); and while she always rides according to Reason's ability on a given day, and she's focused on the ultimate goal of the 2010 WEG ride next September, she's hoping she can let Reason go a bit to see what he can do. "I had a hard time holding him back in his last ride." 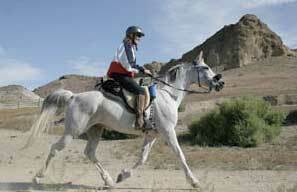 Cheryl and Reason finished 7th in the AERC National Championship in Greenville, California, on September 13th. Cheryl knows her horse so well after riding him for 5 years. "He's super affectionate, he runs up to you in the pasture (as opposed to running away from you). He'll shove me with his head when he's ready to go." With just 3 carefully chosen rides this year - 1st place in the American River Classic 50 miler in April, 2nd place in the Owyhee Fandango 100 in May, and 7th in the AERC National Championship 50 in September, Reason will be shoving her on the 14th. Watch for this pair to finish near the front.